Price includes shipping to the USA & Canada. Books are shipped weekly from south east Queensland, Australia using economy airmail service. Delivery time to the USA is 3-7 weeks. Faster service is available for an additional cost. Please contact us with your requirements for a price quote. Since we are located in Australia shipping will be less to customers in Australia and more to northern Europe. If you are in northern Europe or Australia please contact us to confirm shipping price. ...as he blazes a swathe across Western Europe! Find out what really happened on his last mission that brought his life to a mysterious end! "This book is a perfect example of how good a basically self published book can be. 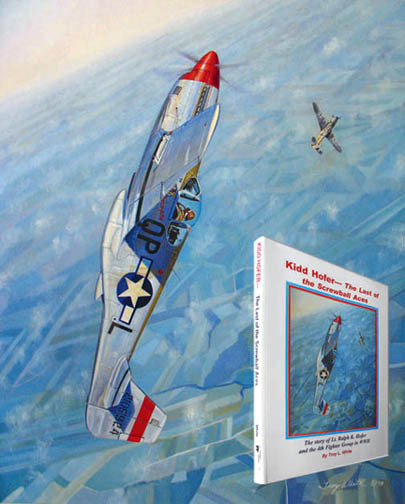 Troy White is an aviation artist who also knows how to tell a darn good story. I must confess that I'd heard of Hofer's plane 'Salem Representative', but knew little else about him. I had no idea that he was the 4th FG's top scoring ace nor that his death in combat remained a mystery for nearly 50 years. I also had no idea that he was from a small Missouri town only about 75 miles from here. Troy White wrote this book and did the layout at home using his computer and a publishing program. The quality that came from that is absolutely first rate. The depth of the information and the extremely high standard of the photographs matches that of many books I've read of much greater price and is better than most. Just to let you know how new this book is, the author's introduction (usually the last thing written) was Dec 8, 2002 and this book was at my doorstep in late January 2003. Just to do the stats thing, it is over 200 pages on high quality paper. It is, as they say, profusely illustrated with photos of men and machines as well as some of Troy's paintings. It is also card-bound, which seems to be preferred by many who buy books. Not only does the author go into the missions flown by Hofer, he also gives an excellent background as to the war situation at the time and relates stories and incidents of his contemporaries and compatriots such as Jim Goodson, John Godfrey, Duane Beeson and Don Gentile. The amount of research is superlative and draws from post combat reports as well as recollections of those who knew Ralph Hofer. Kidd Hofer was in all respects an individual who often shunned standard procedures. This was generally overlooked because he was such an excellent pilot. He got his first victory in his first combat mission, a feat nearly unheard of. He was also an excellent marksman who seemed to instinctively know how to be in the right position to get the best effects from his aircraft. He was also a loner who often left formation to chase after an enemy plane or to strafe a ground target. Even the way he got to be a pilot is a story into itself as it was basically done on a whim! All he wanted to do was fly and had to have promotion from being an enlisted pilot (and the highest scoring one that the USAAF ever had) to 2nd Lt forced on him! 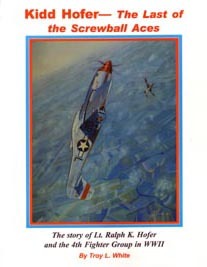 "Kidd Hofer - Last of the Screwball Aces" not only covers the life and times of Lt. Ralph Kidd Hofer and but also chronicles his legendary comrades in arms of the 4th Fighter Group. The book is set against the backdrop of pivotal air battles that were fought in the skies over Nazi occupied Europe during 1943 and 1944 in order to wrench air superiority away from the Luftwaffe and seal the fate of Hitler's Third Reich. With his long hair and football jersey, "Kidd" Hofer stands out as one of the most memorable characters in the 8th Air Force. After serving in the RCAF Hofer transferred to the 4th Fighter Group in September of 1943 and promptly destroyed an Me 109 on his first mission! He went on to become one of the highest scorers in the 4th with a combined score of 29 victories (15 air and 14 ground). The large 8.5"x11" card cover book is 200 pages long and features first hand accounts of the European air war told through combat reports, Squadron and Group records, contemporary interviews and recollections. With over 225 photos and illustrations (many published here for the first time) this book is sure to be a welcome addition to the library of any aviation or history buff. Books are in stock and ready for shipment but supplies of the first edition are running out and there may not be a second edition!